And a wonderful image, it is. Thanks for commenting! They look like celestial drops… tremendous photo! Hello Nigel, thank you 🙂 🙂 :). Wow stunning with the backlight. An old-fashioned bloomer, always reminds me of my grandmother, who loved them. I hope spring in Scotland is as lovely as it is in the Midwest this year. Gorgeous, light-filled photo – I’m jealous, mine are barely out of the ground! You must be north – I’m in Zone 5B. Like everything else, the dicentra are a bit late this year. This one sprouted a branch of all white blooms for the first time! Perhaps you had a white seedling find its way into your pink plant. I have both varieties in my gardens. Yes, I much prefer a cool, wet spring than what we experienced the last two years! The blooms last longer, the hostas love it, and, at least in Illinois, it means more time to enjoy this brief but fertile month or two when everything is green and lush before the sun and humidity take over. 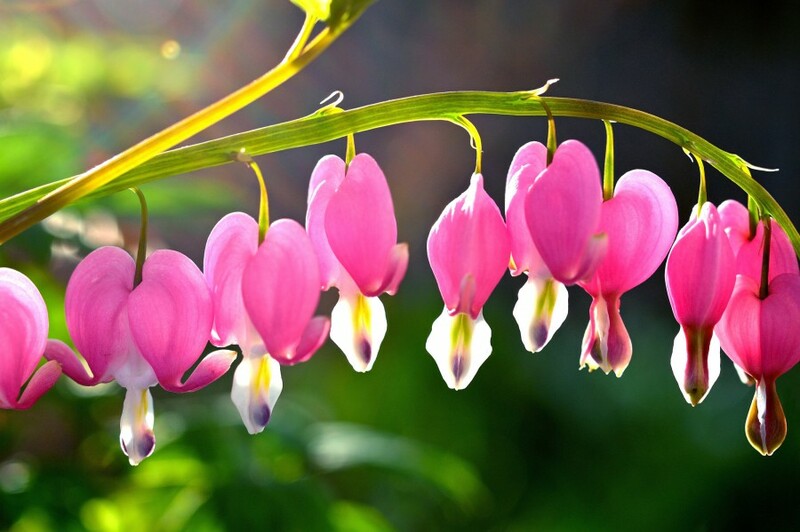 When we had garden I loved Bleeding-Hearts. Very beautiful photos. I am so enjoying all of your beautiful spring photos. Thanks Sharon for brightening my day. Carol! What a lovely thing to say. Thank you for all those visits and your kind comments! It was my pleasure :-).